This Beagle is Numero Uno!!! No longer the Rodney Dangerfield of the top conformation show in the country, the Beagle has finally won the day at Westminster! This little fellow just stole everyone's heart and walked away with first prize. He bested 2,627 entrants at this year's show, coming in 169 breeds and varieties. Defying Vegas odds of 400-1, the days of the Beagle coming up empty again are officially over. If you watched the broadcast on USA Network, you heard commentator David Frei say that the crowd roar was the loudest he'd ever heard in this competition. This little guy was clearly a fan favorite. This is just unbelievable, Beagle fans. In 131 years of Westminster Kennel Club Dog Show history, the breed we know and love has NEVER won Best in Show before. But Uno, a 15 inch beauty, has officially barked and bayed his way into history. According to some, he also could have won "Noisiest in Show"- just the price you pay for having a strong personality and wanting to share your enthusiasm with the rest of the field! 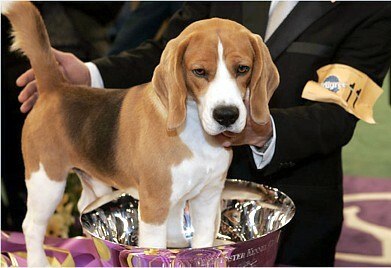 In the first round, Uno won Best in Breed over 12 other 15-inch Beagles. Then, how great was it to watch the first night of judging and see this special little guy beat out 25 others in his group to become the first Beagle to win the Hound Group at Westminster since 1939? It's a great feeling to finally get validation that the breed we know to have a a great temperament and a playful personality "plus" has finally gotten the recognition it's deserved all along. So, move over fussy frou frou dogs, our day has come. Congratulations to Uno, (K-Run's Park Me in First), his breeder, (Kathy Weichert & Leah Bertagnolli), his owner, (Caroline Dowell & Eddie Dziuk & Jon Woodring & Kathy Weichert) and his handler, Aaron Wilkerson, who shares his home with Uno in South Carolina. Next comes the talk show circuit, where Uno can further charm and entertain the crowd. So now the rest of the world can appreciate what we've always known: The merry little hound who loves to sniff, snack, and snooze is indeed Top Dog!!! Uno has a message for his naysayers.